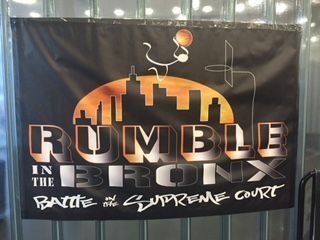 RecruitTheBronx.com always finds it fruitful in attending the Rumble in the Bronx 14u games each year. It gives us a great early look at many of the rising freshman who we will become very familar with over the next four years. Here's some of the Top Performers that we caught this weekend. Isaiah Dorsey 2022 5'8 guard High School: Wadleigh HS - AAU Team: King Hoops - active defensive player. Can break an opponent down with his offensive moves. Average shooter. Mike Atta 2022 6'3 small forward High School: Pope John (NJ) AAU Team: Rise As One - versatile player. Decent passer. Sees the court. Very coachable on the court. JJ Starling 2022 6'2 guard High School: Baldwinsville HS (NY) AAU Team: Albany City Rocks Black - gets to the basket and has the ability to play above the rim. Good speed. Odanis Done 2022 6'1 point guard High School: Manhattan Center AAU Team: Castle Athletics- solid perimeter player. Plays good all around game. Can dribble and get others involved. Jaden Fleming 2021 6'1 point guard High School: Metropolitan Expo of Learning AAU Team: Rising Stars - big guard has court awareness. Can rebound and play defense. Good with his dribble. Chris Jones 2022 6'2 point guard High School: St. Lukes School (CT) AAU Team: CT PHD - explosive offensive players. Good IQ. Can hit the mid range shots. Mike Olinvencia Jr 2022 6'1 guard High School: Kolbe Cathedral(CT) AAU Team: CT PHD - can shoot the mid range and 3pt shot. Good court vision. Good passer. Noah Best 2022 6'0 guard High School: Unknown AAU Team: PSA Honey Bagers - good ball handler. Can finish around the basket. Can be a good defender. Mekhi Conner 2023 5'5 point guard High School: Unknown/Elm City Middle School AAU Team: Elm City Elite - good feel for the game. Good court vision. Makes others and can score. Can make passes. Reid Durcharme 2023 6'2 guard High School: Nobles & Greenhough (MA) AAU Team: Boston Bobcats - good catch and shooter and can create space for shots. High motor. Nice size makes him an above average rebounder. Drew Herer 2022 5'11 guard High School: Beaver Country Day (MA) AAU Team: Boston Bobcats - good shooter. Can handle the ball. Can play combo because of his passing abilities. Maury Ward 2022 5'7 guard High School: Fordham Prep (NY) AAU Team: Riverside Hawks - athletic, hard playing and smart. Eg., his team down 3, with only seconds remaining, he baits the defender into fouling his 3 point attempt. Runs the floor well, finishes through contact. Joey Medlin 2022 6'5 power forward High School: Archbishop Molloy (NY) AAU Team: Riverside Hawks - classic, strong-man Big. Signature play is creating space for the offensive rebound/put back, then getting himself fouled on the and-one. Left handed, low post game also made him a foul-magnet. Nicholas Paladino 2023 5'7 guard High School: Our Saviour Lutheran (NY) AAU Team: Riverside Hawks - prolific score for a 7th grader playing up. Excellent change of direction game. Unstoppable quick-release floater game. Sets up the pick n roll game with good timing and pace. Francisco Matte 2022 5'11 guard High School: Archbishop Stepinac (NY) - AAU Team: Riverside Hawks - athletic and sturdy built body for a guard. Aggressive in attacking the basket in iso mode. His investment in his 3 point shot development will determine his upside. Marco Lainez 2022 6'1 swing High School: Montgomery HS (NJ) AAU Team: United Prospects - a player with big guard potential at the next level. Too quick for the bigs to guard, too physical for the guards to check. His investment in his 3 point shot development will determine his upside. Ryan Curry 2022 5'9 guard High School: Montgomery HS (NJ) AAU Team: United Prospects - a fun to watch scorer. Big arc, high release three ball game. When run off the 3 point line, he showed an excellent arsenal of head fake, stop-n-go and stop-n-pop play creation moves. Caton Summers 2022 6'4 forward High School: Good Counsel HS (MD) AAU Team: Maryland Sharks - a high potential big body. Focus point for an inside-out offense. Excellent shoulder quickness on low post spin moves. Already using up-n-under moves. Terrific pick-n-roll screener and roll target. Zaire Baines 2022 5'9 guard High School: Portledge School (NY) AAU Team: Seaford Heat - big time scorer from all levels. Per his coach, put up consecutive 50 point games during the winter season as an 8th grader playing on varsity. Aazayah Ross 2022 5'11 guard High School: Portledge School (NY) AAU Team: Seaford Heat - strongly built guard, allowing him to physically dominate his match-ups. Sees the floor well, has a nose for the rebound and has quick hands on defense. Chima Obayi 2021 6'0 guard High School: Archbishop Molloy (NY) AAU Team: Lightning Warren - plays hard and with a great attitude, coach calls him "special". Plays intense defense. Attacks the basketball fearlessly. Outside shot shows promise. Nick Watts 2022 6'3 forward High School: Northport HS (NY) AAU Team: Lightning Warren - tough, physical kid. Plays hard all of the time. Loves to rebound. A defender with excellent footwork. His investment in his skill development will determine his upside. Ryan Weiss 2023 5'7 guard High School: Undecided/Hewitt (NY) AAU Team: Lightning Warren - a 7th grader playing up, but has already clearly put the work the work on his shot reps, with that being a key indicator of a bright future. Loves to compete. 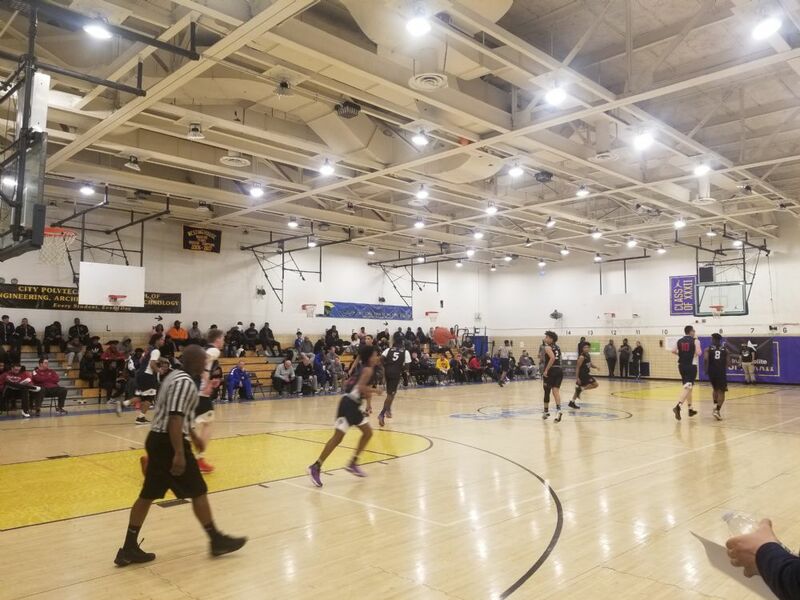 Recruit The Bronx was in the building to watch some of New York City's unsigned seniors showcase their talent in front of more than 30 college coaches at George Westinghouse HS. James Barrett,the tournament director, had approximately 40 seniors playing in two showcase games. The first game was Team Batman vs. Team Spiderman and the second game was Team Captain America vs Team Black Panther. Below are The Recruit The Bronx top performers. Kevon Leary 2018 6'5 wing Metro BDA - athletic in transition. Quick leaper. Decent passer with some playmaking abilities. Runs the floor. Needs to be a better shooter and work more on his weak hand dribble. Kenneth Hines 2018 6'6 forward Metro BDA - effective in the post with his rebounding and face up moves. Will surprise you with his ability to dribble drive. Knows how to create space when he puts his weight on you. Needs to get in better shape. Victor Ogbo 2018 6'5 forward Brooklyn Law & Tech - good rebounder. Always in the right spot around the rim. Decent defender in the post. Has good hands. Average offensive skill set but finishes at the basket. Needs to increase his vertical. Damarly Smith 2018 6'1 guard Our Savior Lutheran - strong with his play. Not afraid to be physical on offense or defense. Can hit open shots. Knows how to use his dribble to create a driving lane. Decent passer. Needs to stay consistent with his 3pt shot. Dallas Watson 2018 6'3 guard St. Raymond HS - good player. Knows when and how to attack the basket. Can play at the rim. Solid athlete. Very capable of making plays and being a scoring threat. Needs to work on his outside shooting. Tyler Bourne 2018 5'8 point guard Notre Dame - Fairfield (CT) - solid player. Good point guard. Has the ability to take over the game with his scoring. Effective 3pt shooter. Can play make off the dribble for himself and others. Good with his pass. Needs to get stronger and use his speed to defend harder. Wahaad Johnson 2018 6'0 Bedford Academy - good 3pt shooter. Has decent range on his shot. Plays with good intensity. Can score the ball. Can beat you off the dribble. Needs to be consistent shooting when being closely guarded and his one the ball defense. 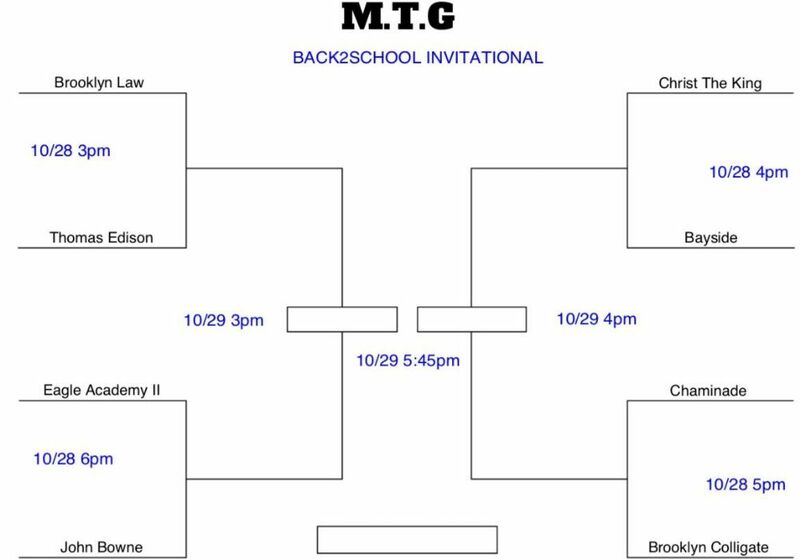 Jamahl Humbert 2018 6'4 wing McKee HS (Staten Island) - can play above the rim. Good athletic ability. Effective going down hill. Can be a good rebounder. Streaky shooter. Needs to work on his passing skills and defense. Ali Sumareh 2018 6'4 wing South Bronx Prep - makes good use of his size when rebounding. Can get you some put back baskets in the paint. Can get the rebound and start the fast break. Can play up tempo and is good in the open court. Good offensive player. Needs to work on his shot and dribble. Kenneth Hines 2018 6'5 center Metro BDA - good big man. Can rebound. Knows how to make space for himself in the post. Can dribble drive the ball when he allowed to face up. Need to play with constant intensity and get in better shape. Savion Thousand 2018 6'2 guard Metro BDA - can make plays. Good with the dribble and pass. Knows how to find others. Moves well without the ball and gets rebounds from the guard position. Needs to look more for his 3pt shot. Anthony Marshall 2020 5'8 point guard Metro BDA - good point guard. Can handle the ball and play up tempo and at different speeds. Can excel in pick n roll action. Has the ability to shoot the 3pt shot and be a scoring threat. Needs to lock in on defense all the time. DeSean McNeil 2018 5'9 point guard Metro - reliable player. Willing defender. Solid as role and utility player. Decent skill set. Needs to finish more at the basket. Lance Amir Paul 2018 post grad 5'10 point guard Convent Prep - tough and strong to the basket. Quick first step. Good with controlling his dribble. Getting better with his shooting and leadership. Will find open teammates with his pass. Needs to stretch the defense with his shooting. James McNeil 2018 post grad 5'9 point guard The Robinson School - can run the point. Very efficient player. Makes good use of both hands. Can be creative with his pass. Average defender. Needs to be a better shooter. Jared Rhoden 2018 6'6 wing Our Savior Lutheran National Team - can shoot and get to the rim. Good ability to score. Versatile player who can hit the 3pt shot and mid range shot and floaters inside the lane and paint areas. Good instincts with his dribble. Not afraid to be aggressive. Needs to be a go getter on defense. Simisola Shitto 2018 6'9 forward Vermont Academy - good player. Rebounds with authority. Moves well in and out of the post. Plays at and above the rim. Can finish with power. Can handle the ball some and make passes. Needs to work on shooting. Nicholas Johnson 2019 6'3 wing All Hallows HS - lefty. Plays hard. Undersized when he goes into the paint but can scrap it up inside. Well go and get some rebounds. Good energy. Can hit the mid range shot. Needs to work 3pt shooting. Jahmir Appleton 2018 6'5 forward Eagle Academy BX - can run the floor. Can hit the mid range shot. Effective rebounder. At times will block a shot or two. Needs to work on more athletic post up moves and driving the ball to the basket. Amadou Traore 2019 6'7 forward Brooklyn Collegiate - good size. Runs hard. Can rebound. Decent moves when he catches the ball in the post. Will give a honest effort to defend his man in the post. Needs to be more of a scorer. 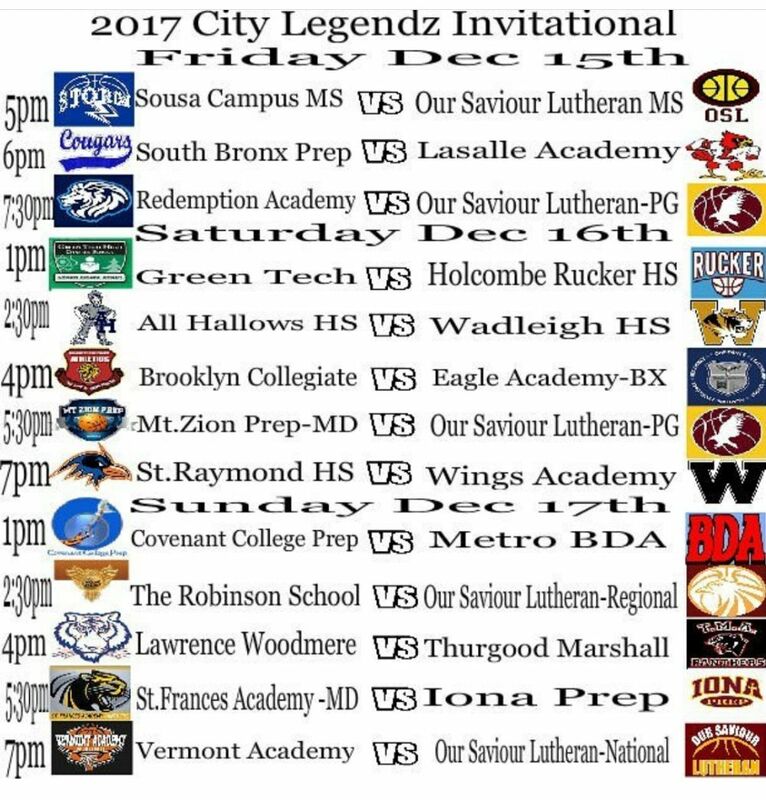 Glen Anderson 2019 5'6 point guard Brooklyn Collegiate - fast fast and fast. Can get the ball up the court in a hurry. Can ball dribbling skills. Knows how to pressure the ball on defense. Effective passer. Needs to stay under control with his dribble when he is racing up the court and shooting over defenders. Brendan McGuire 2018 6’7 Small Forward Chaminade HS - good coast to coast finisher who finishes well with both hands, good court vision, can be a point-forward, attacks the basket strong thru contact, good shooting form. Needs to be a more consistent shooter and be more aggressive on defense. Liam Brennan 2019 6’8 Center Chaminade HS - good inside finisher, can finish with both hands, decent rebounder. Needs to work on his stamina and vertical. Mike Ferrara 2018 6’0 Guard Chaminade HS - good 3pt shooter, shows a good understanding of the game, disciplined defender plays good on ball defense. Needs to be more of a playmaker. Tashon Taylor 2018 6’4 Forward Edison HS - high energy player, non stop motor on both ends of the floor, tough interior defender, aggressive rebounder. Athletic game but needs to be more controlled, wild at times. Taijay Good 2020 5’9 Point Guard John Bowne HS - knockdown 3pt shooter, confident shifty guard who can score in bunches, quick first step, good passing skills. Needs to be more aggressive on defense. Teequan Holley 2019 6’6 Power Forward John Bowne HS - good interior defender, tries to contest and block every shot, athletic,very raw offensively. Needs to be a more consistent finisher inside. Tyrese Apple 2019 6’2 Shooting Guard John Bowne HS - can score inside-out, crafty scorer finishes well on the drive, quick hands on defense. Needs to look for his shot more. Josh Lugo 2019 6’5 Forward Frederick Douglass Academy - invites contact on the drive, adept at drawing fouls and converts his free throws, runs the floor well, hustles for loose balls. Needs to work on his handle and outside shot to be a SF at the next level. Jaylen Davis 2019 6’3 Shooting Guard Christ The King HS - cerebral scorer makes it look easy, very crafty can score inside-out. Needs to be more aggressive on defense, streaky shooter. Nathan Curry 2019 6’3 Forward Christ The King HS - good discipline on defense goes all out on that end, good form on his shot, makes smart cuts moves well without the ball. Needs to increase his range and work on his handle to be more of a wing at the next level. Felo Niclas 2018 6’0 Combo Guard Springfield Gardens HS - a 3pt sniper, tight handle creates good separation, very good perimeter defender quick hands, athletic finisher. Needs to distribute more to be a true PG. Nasir Modeste 2018 6’2 Guard Eagle Academy II - explosive leaper attacks the basket strong, will sky for rebounds with the trees, decent handle. Needs to increase his range.